Here are some of my husband’s and my favourite summer destinations in Europe that are slightly off the beaten track, but still easy to get to from a nearby major city. And, best of all, they are all budget friendly! Founded in 43 BC by the Romans, Lyon is located in 470km south of Paris and is a great weekend destination for relaxed French culture, delicious cuisine and incredible local wines. A hidden gem itself, the beautiful city of Lyon is also known as the gastronomic capital of France and boasts an ancient amphitheatre and a number of historic sites to explore. Atop Fourvière Hill, the UNESCO World Heritage listed Grand Roman Theatre is an impressive reminder of Lugdunum, the Gallo-Roman city which would later become Lyon. Part of the theatre was built in the centre of the ancient settlement in 15 BC, and the final construction of the larger 108m diameter amphitheatre was completed at the beginning of the 2nd century. The Grand Roman Theatre is open daily (except Mondays) and is free to visit. 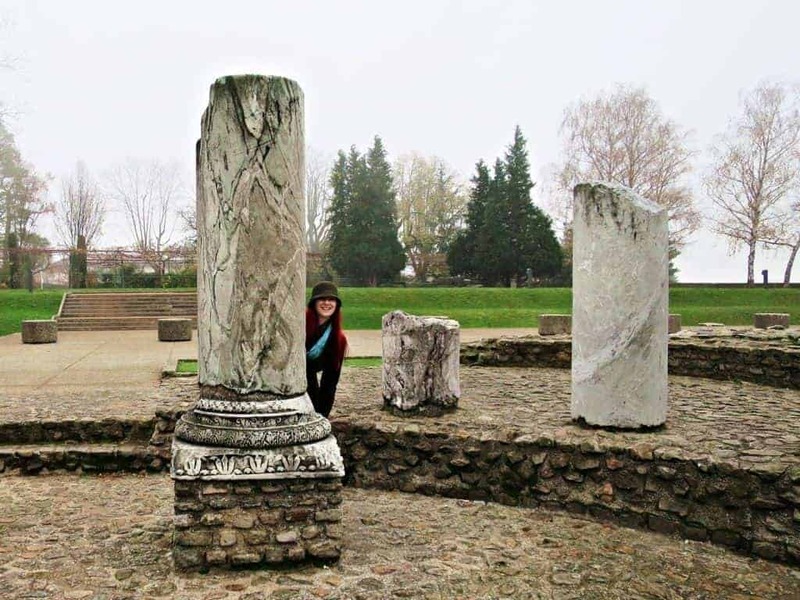 Seating 10,000 people, the well-preserved ruin is one of the most impressive Roman sites in France and is still used as a cultural venue today. If you are fortunate enough to visit Lyon during the Nuits de Fourvière festival, you can purchase tickets to a theatre, music, dance, or opera performance that takes place in the theatre each year. 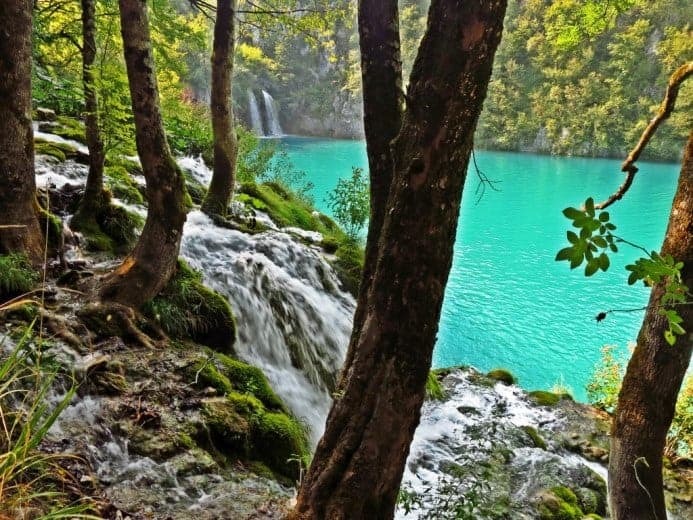 One of the most beautiful and colourful natural sites in the world is Plitvice Lakes National Park in central Croatia. Located just a few hours’ drive south of capital city Zagreb, the UNESCO registered park features beautiful blue lakes, natural travertine dams, a range of fauna and flora, and stunning waterfalls. It’s no surprise that the largest national park in the country is an increasingly popular tourist destination and a must-see when you visit Croatia. Plitvice Lakes National Park is world famous for its sixteen cascading lakes that are interconnected by a series of waterfalls and rivers stretching over eight kilometres. The impressive lakes are renowned for their distinctive and ever-changing colours that range from azure to green, grey or blue, depending on the quantity of minerals or organisms in the water and the angle of sunlight. A number of walking paths, buses and ferries enables visitors to easily explore the beauty of the lakes and some of the park that spreads out across 300 square kilometres of mountains and woodland. The entire walk, including a bus ride to the upper lakes and a ferry ride across to the lower lakes, can take about five hours and is well worth it. If you are in Europe and searching for a laid-back and affordable beachside paradise, look no further than the beautiful city of Zarautz in Spain. Located on the Cantabrian Sea in Basque Country (north Spain), Zarautz is well connected by train and bus to San Sebastián and Bilbao, and has become a popular summer spot for Spanish locals. And, it’s not hard to see why! 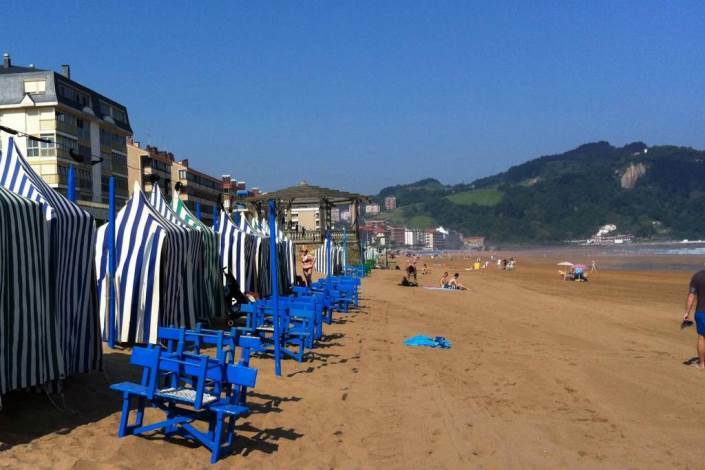 Zarautz features a historic town centre and a quiet promenade that stretches the length of the 2.5 km long surf beach. The beach itself is just like a postcard; on the smooth golden sand, blue and white striped tents provide shelter for families building sandcastles and enjoying the sun. In the water, surfers stretch out on their boards atop the crystal blue sea and weave between the swimmers as they catch large rolling waves into shore. Zarautz’s waves make it a nirvana for all surf-lovers, whether they’re competing in world-class surfing competitions or beginners learning how to surf. If surfing isn’t your thing, the promenade and pretty town center are filled with small bars and restaurants boasting traditional cuisine, such as delicious “pintxos” (Spanish tapas) and fresh fish casseroles, which can be paired excellently with the local wine. The local cuisine is one of the most exquisite and famous in the whole Basque Country. Secluded on the picturesque Bay of Kotor (Boka Kotorska) in Montenegro, the old Mediterranean port of Kotor is one of the most beautiful coastal towns in the Balkans. 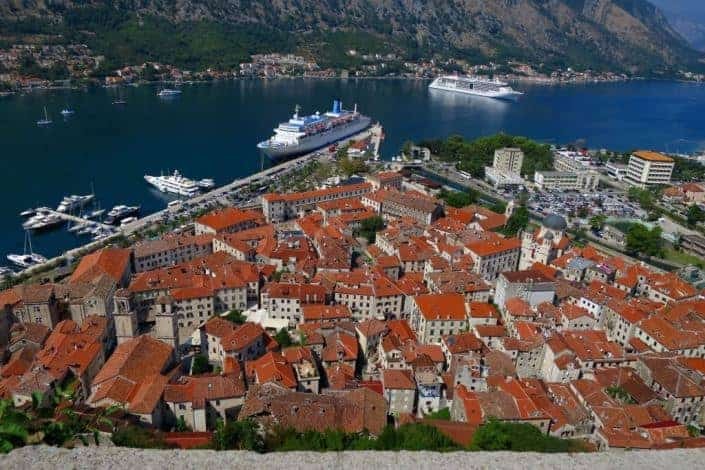 The medieval-looking city has a population of 13,500 people and is part of the UNESCO World Heritage Site dubbed the “Natural and Culturo-Historical Region of Kotor”. (Cue: Game of Thrones introduction music) Kotor’s Stari Grad (Old Town) is nestled inside fortifications built during the Venetian period and features well preserved churches, charming squares, and informative museums that will take about two hours to explore on foot. The old town is so beautiful and surreal that you wouldn’t be the only one to think you had just stepped into a fairy tale, or on to the set of Game of Thrones. See more photos from our stay in Kotor, Montenegro. Orašac is a small hillside town located on the coast just 11km north of Dubrovnik. At the bottom of the hill, just 250m from the main highway and nearby campground, is a secluded pebble beach with warm salty waters. The turquoise water is deep but calm in the little beach cove. And, there is a stone sea wall from which the kids (and big kids) launch themselves into the sea. 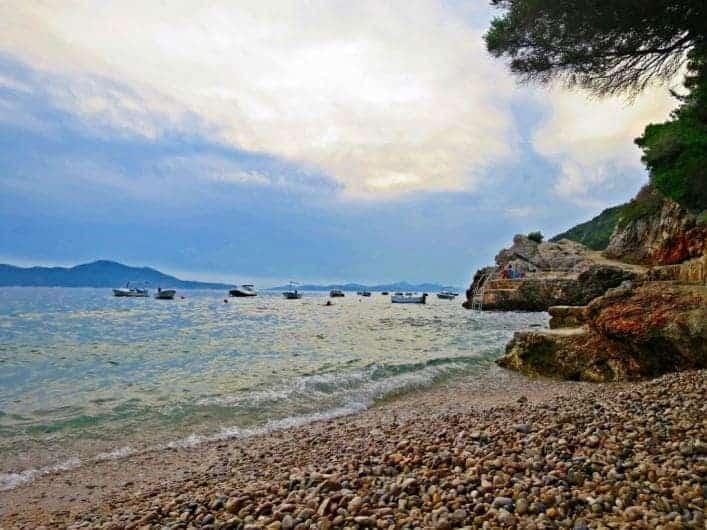 A small beachside café offers visitors breezy panoramic views over the ‪‎Adriatic Sea and a seafood cuisine that is fresh and delicious. From the campground or café, you can arrange for a day trip out to the islands. The boat will pick you up from Orašac beach and take you to the Elaphite Islands of Koločep, Lopud and Šipan. You will have some time on each of the island to explore the little towns, hike up the hills and buy local delicacies such as marmalade and sugary lemon rinds. For lunch, the Croatian skipper cooks up a delicious BBQ fish and continuously fills your glass with local wine while you float in the Adriatic Sea. It’s the perfect day out. And, since Orašac is so close, you can catch a bus into Dubrovnik and spend the day exploring the medieval old town that was featured in the first few seasons of Game of Thrones. The romantic old city lies within an uninterrupted ramparts that run for approximately 1,940 metres and joined the UNESCO list of World Heritage Sites in 1979. Discover what else you can see and do in Dubrovnik, Croatia.